Jennifer Blood Omnibus is Coming! 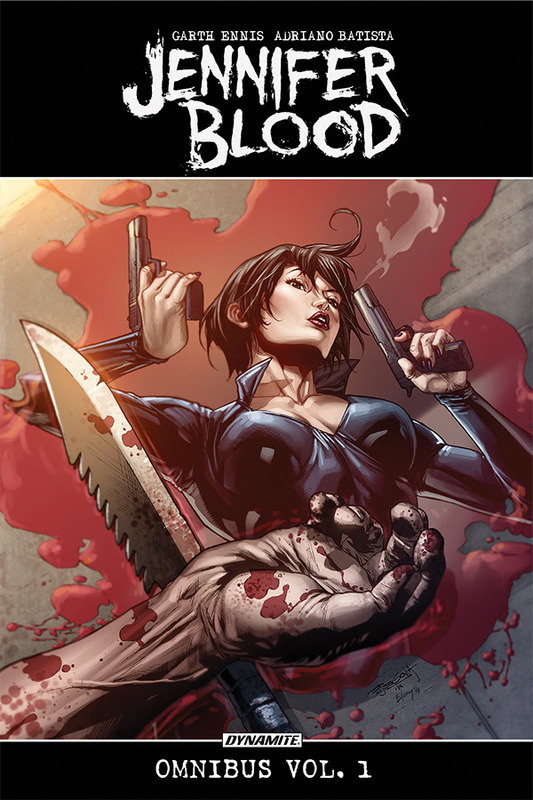 Dynamite Entertainment is proud to announce the upcoming release of Jennifer Blood Omnibus. The first four volumes of the happy homemaker by day / violent vigilante by night collected together for the first time. The 760-page tome comes from the brilliant minds of comic icon Garth Ennis and fan-favorite writer Al Ewing and is filled with the pulse-pounding action that made this one of Dynamite’s best-selling series. Meet Jennifer Fellows, your average suburban housewife. Every day she makes breakfast, takes the kids to school, cleans the house, maps for an hour or two, makes dinner, puts the kids to bed, and kisses her husband goodnight then hopes the drugs she gave them in their dinner keep them asleep until morning. Meet Jennifer Blood, ruthless vigilante. Every night she stalks the underworld on a personal vendetta against organized crime, determined to obliterate the parasites and scum who run the city’s rackets. But, can she keep her dual life separate? Besides Jennifer Blood, Ennis is the creator of the hit series Preacher, which is a live-action series for AMC having recently wrapped up it’s third season, and The Boyswhich is also being adapted for a television series that will start Karl Urban, Jack Quaid and Elizabeth Shue airing later in the year on Amazon Prime. When Ennis left the series, the baton was passed to The Immortal Hulkwriter, Al Ewing, who continued the characters successful run. Al also wrote the spinoff series The Ninjettes, about three college girls turned into silent killing machines. The collection also includes the work of artists Adriano Batista (Jungle Girl), Kewber Baal (Jeepers Creepers), and Eman Casallos (KISS: The Demon). The softcover trade features a cover by Stephen Segovia (Detective Comics). The omnibus includes the first four volumes of the Jennifer Blood series: A Woman’s Work is Never Done, Beautiful People, Neither Tarnished Nor Afraid, and the Trial of Jennifer Blood as well as the Ninjettes six-issue series. There will also be an interview with Ennis and additional bonus material, sketches and a cover gallery featuring the work of Tim Bradstreet, Ale Garza, Jonathan Lau and many more. The Jennifer Blood Omnibus will be solicited in the January issue of Diamond Previews catalog, the comic industry’s premier source of merchandise for the comic book specialty market, and scheduled to ship in March of 2019. Readers are encouraged to order through their local comic retailers or through digital platforms courtesy of Comixology, Kindle, iBooks, Google Play, Dynamite Digital, iVerse, Madefire, and Dark Horse Digital. Fans are encouraged to follow Dynamite Entertainment’s social media channels for the latest updates on Project Superpowers comic books and graphic novels.